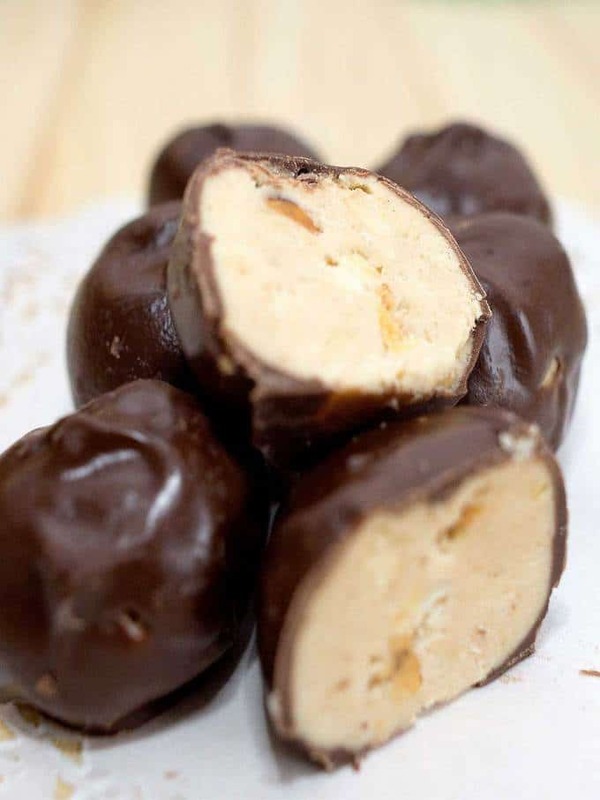 If you like Reese’s Peanut Butter Cups, you’ll love these peanut butter balls! They have only 4 ingredients, and are super easy to make, albeit a bit time-consuming. 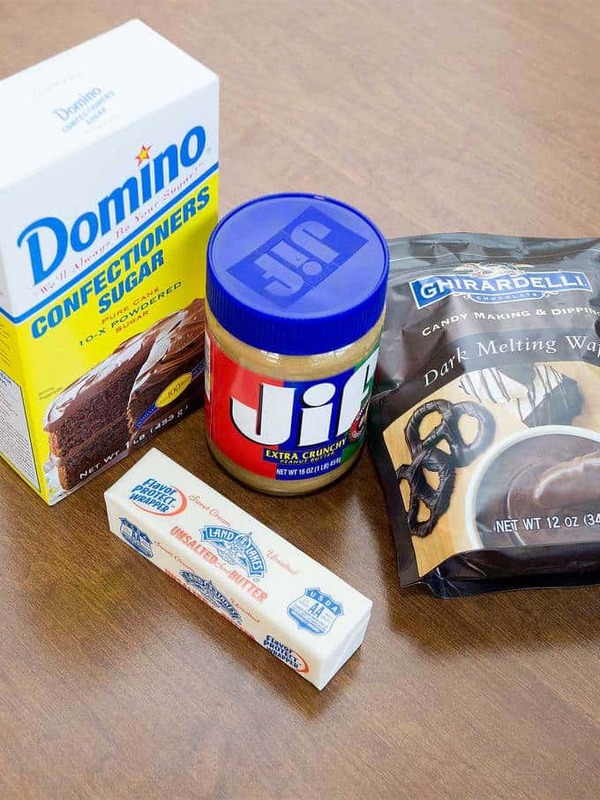 They are the ultimate peanut butter and chocolate treat, and a perfect candy to make for the holidays! 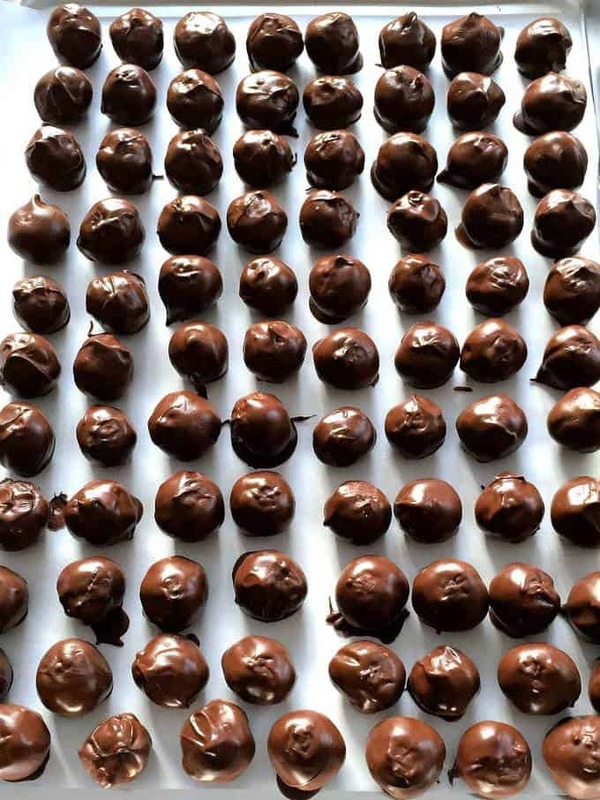 For whatever reason, a lot of people decide not to fully coat the peanut butter balls with chocolate, and rather call them buckeyes. Maybe it’s easier that way. From my perspective, however, I want to ensure that the candy is fully coated coated in chocolate. A lot of people also tend to make them too big. I like mine to be truly bite-sized, no more than 1-inch in diameter. I actually got my recipe for peanut butter balls from a candy-making class that Susan and I took years ago. In that class, we made peanut butter cups. I thought that the peanut butter mixture had the perfect mix of the three key ingredients: Peanut butter, confectioners’ sugar, and unsalted butter. The final ingredient is a chocolate candy coating. For the coating, I use Ghiradelli Dark Melting Wafers. You could also use semi-sweet chocolate chips melted with a bit of shortening. As a first step, I beat room temperature unsalted butter with the peanut butter until the mixture was smooth. I like the crunch of peanuts, so I always use Jif Extra Crunchy peanut butter, but you could just as easily use creamy peanut butter. Then, I added the confectioners sugar to the peanut butter mixture. At first, I used the electric mixer to combine the ingredients, and then I used my hands to knead the mixture. 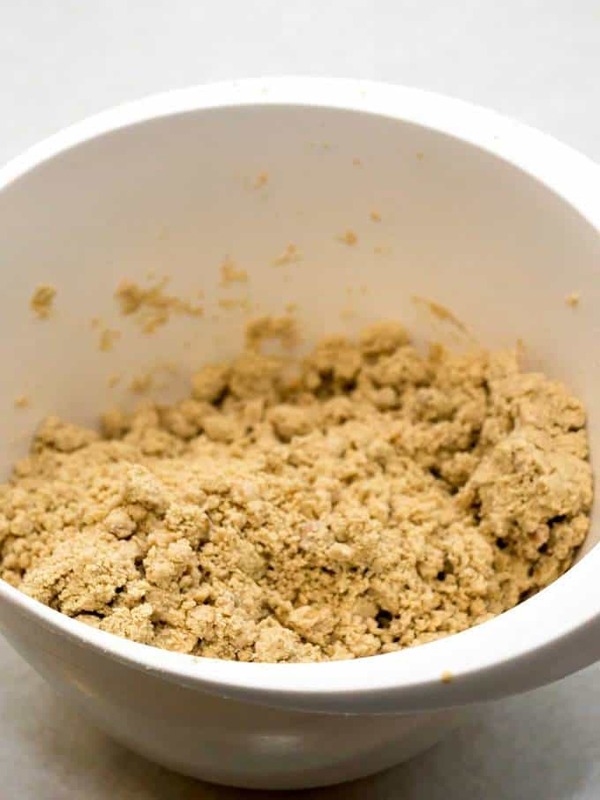 A word of caution – the mixture is very crumbly. 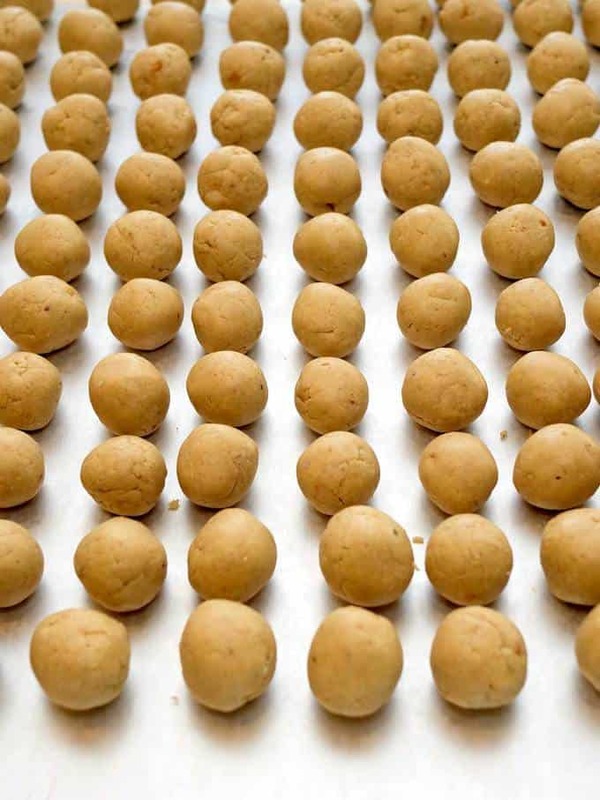 It’s important to me when I make the peanut butter balls that I keep the balls on the small side to make them more bite-sized. 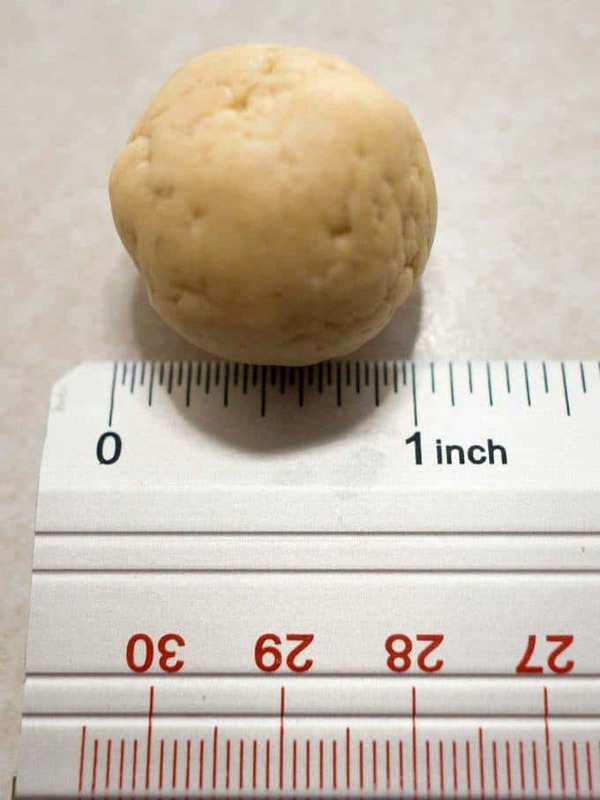 Therefore, I rolled the mixture into small balls (about the size of a quarter – less than 1-inch in diameter) and placed them on parchment lined baking sheets. I’ll admit that this is a bit tedious, but it’s totally worth the effort. 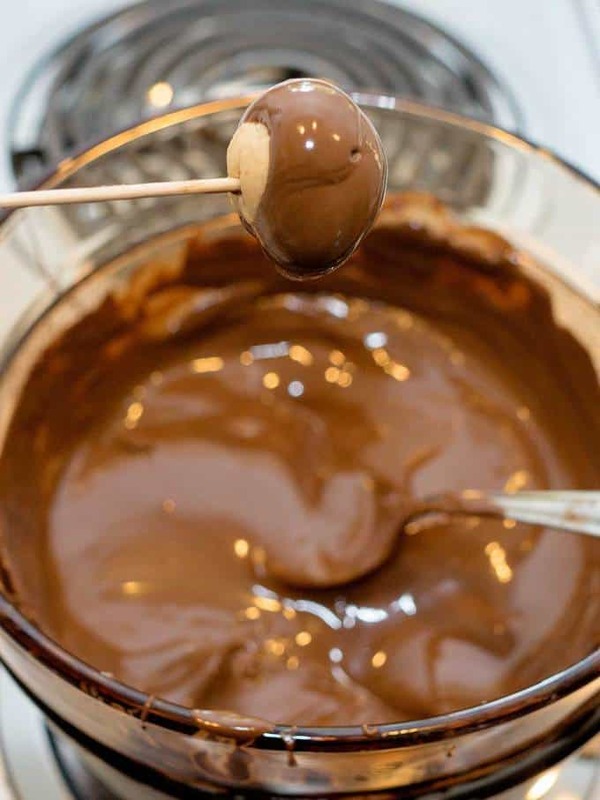 Next comes the really tedious part – dipping each ball in the chocolate coating which has been melted in a double boiler set over simmering water. It’s important here that the bottom of the pan not touch the water, and that the water does not actually boil. I’ve found through the years that the best way to dip the peanut butter balls is to use a toothpick, with another toothpick handy to help remove the dipped peanut butter ball. I don’t worry too much at this point about ensuring that the candy is fully coated. The reason is that it’s easy enough to drizzle a bit more chocolate on the top to fully coat the peanut butter ball. I placed each dipped piece of candy on parchment lined baking sheets to allow the chocolate to fully set. The result is around 80 absolutely delicious peanut butter balls. I like to roll the individual peanut butter balls in colored foil when I give them as gifts. They are one of the most requested candies that I make for the holidays. Yum! 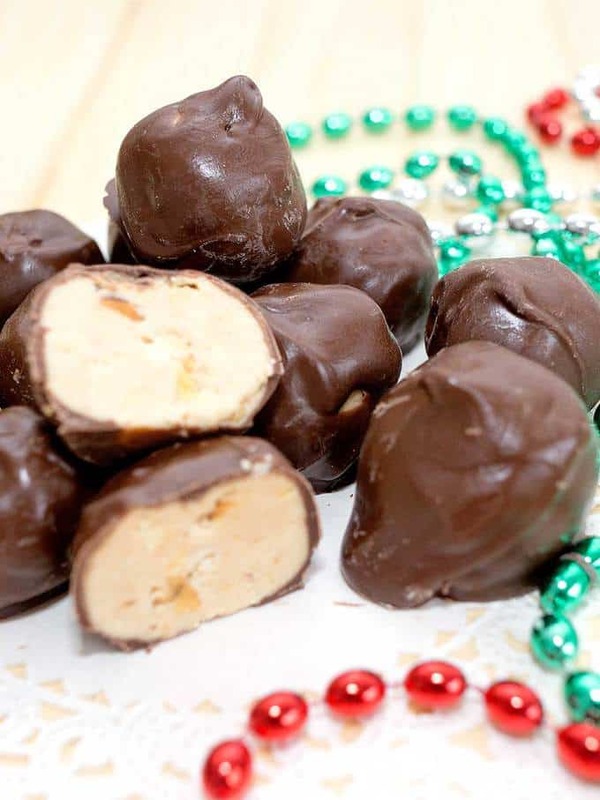 If you like Reese’s Peanut Butter Cups, you’ll love these peanut butter balls! They have only 4 ingredients, and are super easy to make, albeit a bit time-consuming. Line two large baking sheets with parchment paper or waxed paper. Set aside. 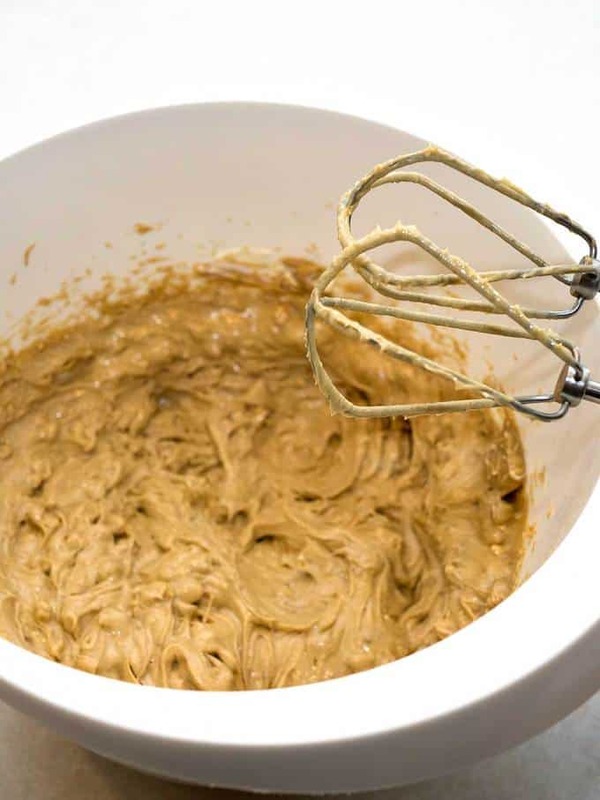 Beat peanut butter and butter in a medium bowl with electric mixture until smooth. Add confectioners sugar. Beat on low to begin to combine the ingredients. Finish by kneading by hand until thoroughly mixed. Mixture will be crumbly. Roll into balls about the size of a quarter; place balls on prepared pan. Meanwhile, melt chocolate wafers in the top of a double boiler set over simmering water; stir until smooth. Insert a toothpick in top of peanut butter balls and dip into chocolate. Let excess chocolate drip off. Place the coated balls on prepared pan; drizzle a small amount of chocolate on top of balls to cover the hole made by the toothpick. Let cool completely. Store in airtight container. Yield: 80 peanut butter balls. *Note: May use 3 cups semi-sweet chocolate chips melted with 1-1/2 teaspoons shortening in place of chocolate candy coating.